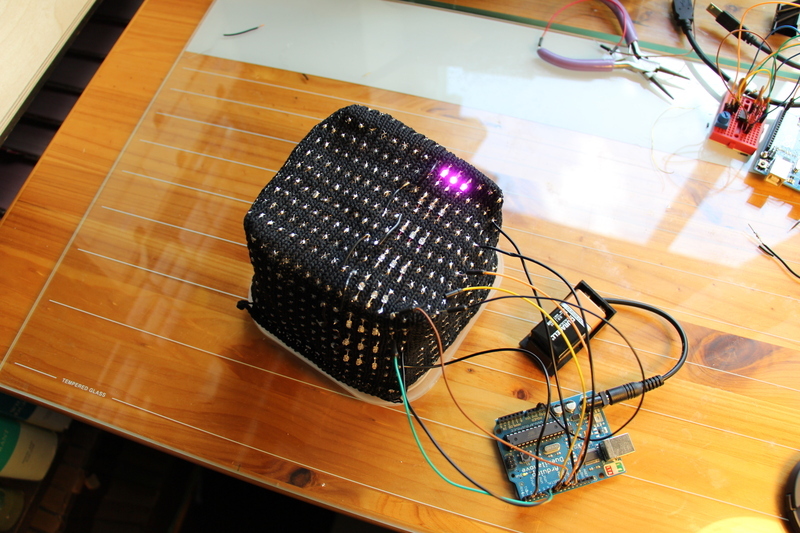 Hatch curator Erin Toale suggested I knit a cube as a warmup for creating sculptural (not wearable) knitted circuits. The process gave me lots of ideas (which is good-- the show is in October!). 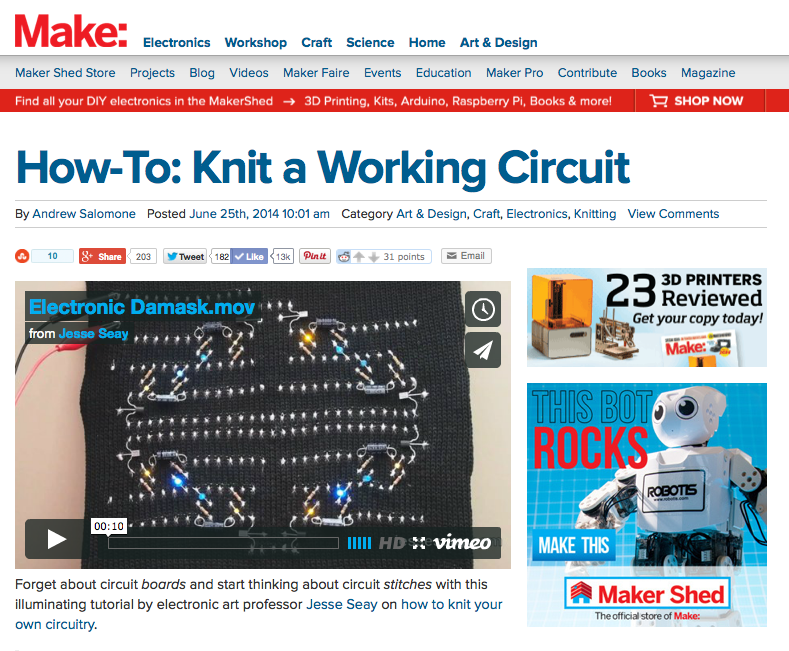 I posted my instructable for knitted circuits June 16, and had fun watching it spread across a tiny corner of the internet. 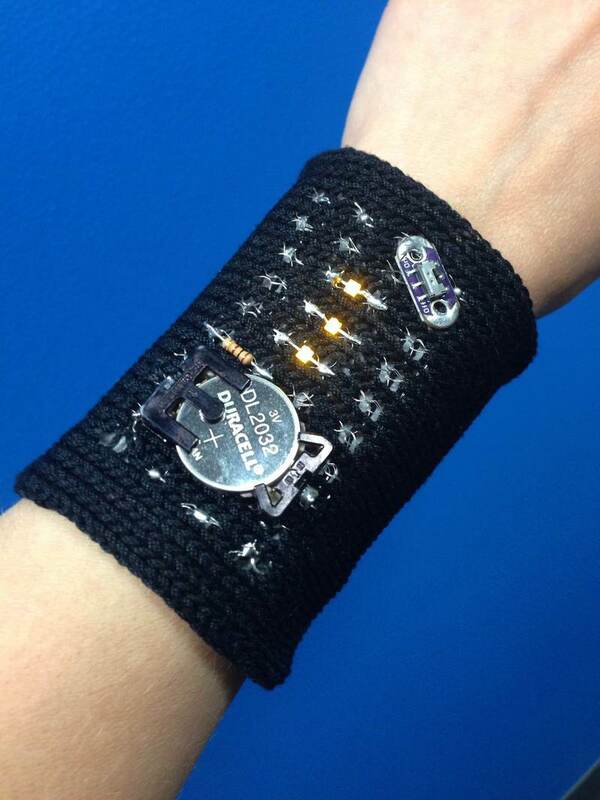 I got the idea for this pattern from the wee blinky, an astable multivibrator that flashes a pair of LEDs. 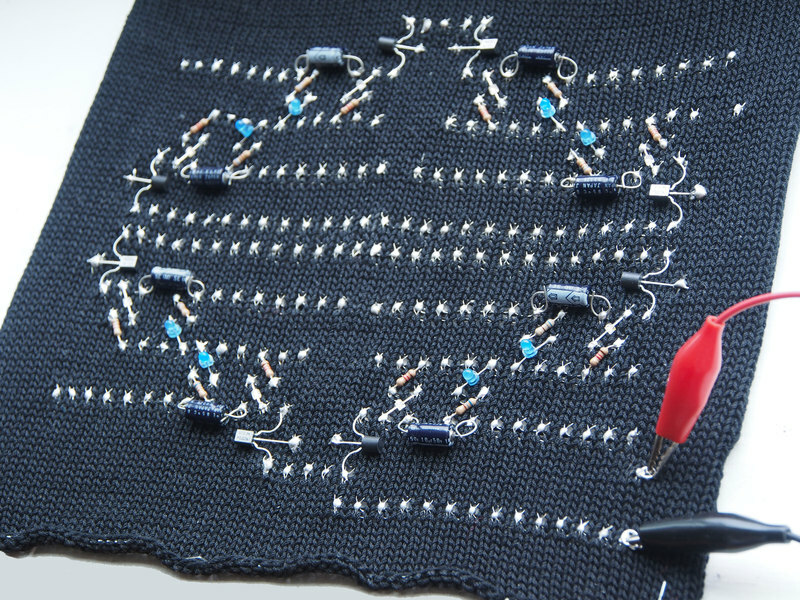 To create a knitted circuit pattern, I tried to minimize the number of places where traces cross over each other and require jumpers. It was fun to plan, and after I got one working, I started multiplying it to create a pattern reminiscent of damask. Capacitors and Transistors and Chips, Oh My! 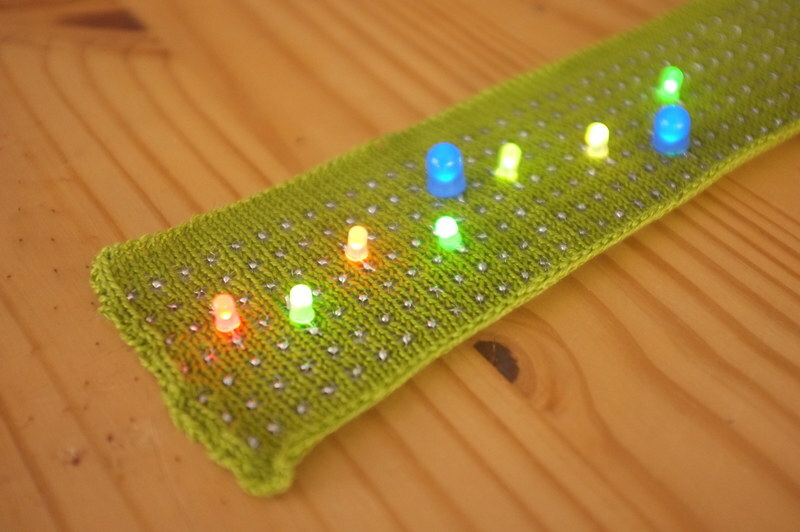 Knitted circuit: 5mm RGB fade LEDs, 8mm blue LEDs, battery and switch. 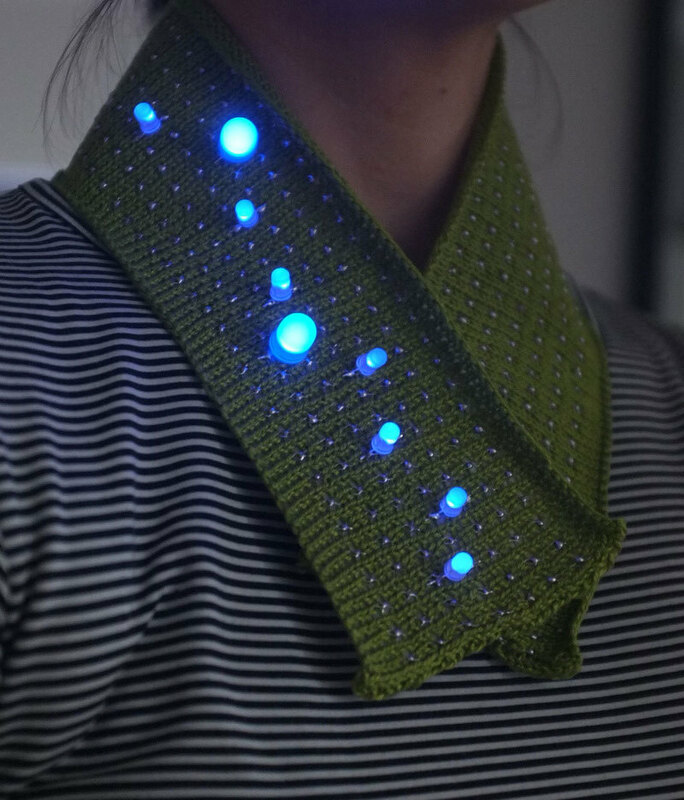 The LEDs (both the blue and the RGB fade) are wired in parallel, soldered in place. Fun fact -- red draws the most current. So, when the color-changing LEDs turn red, they draw so much current they starve out the big blues. The result -- the blues fade in and out, no micro-controller needed. 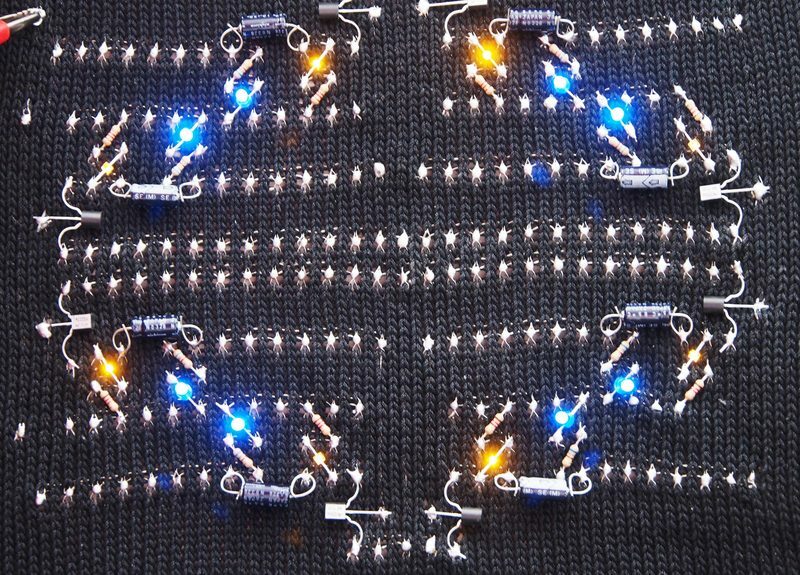 Two knitted circuit boards, with iron-on backing. The short answer is, I can't sew. 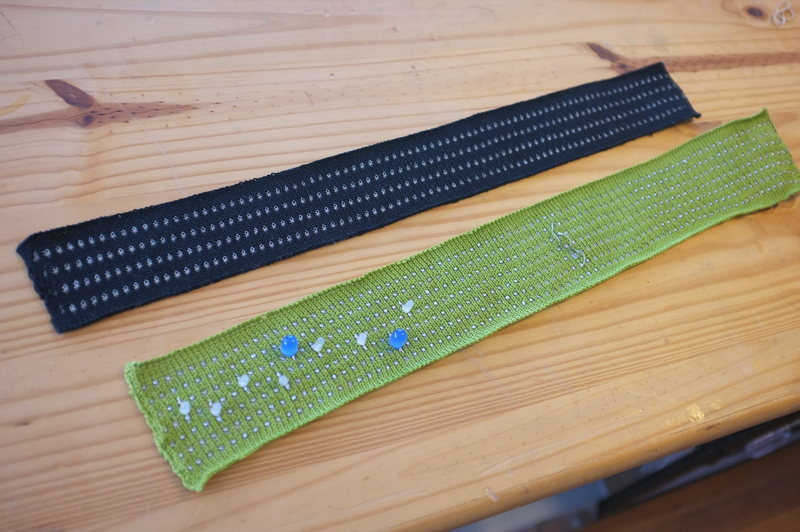 E-textile platforms are based on designing materials to fit textile fabrication methods, resulting in conductive thread and components mounted on PCBs designed especially for sewing (for example, the Flora platform). 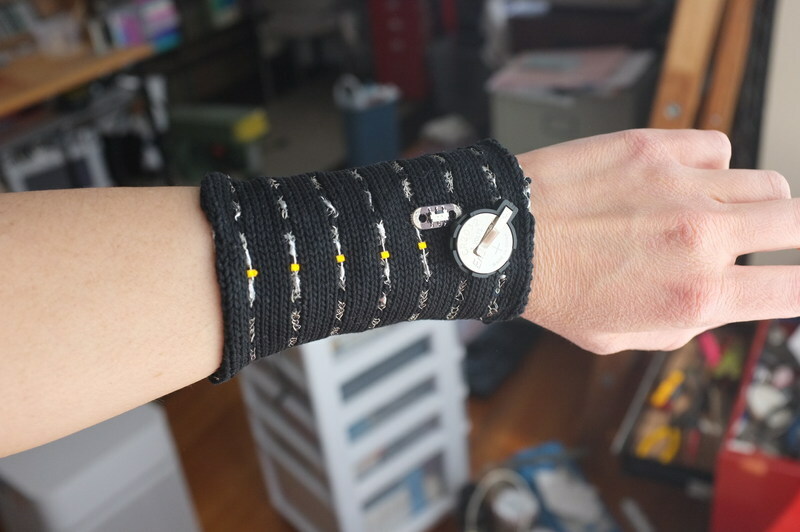 Perfect for experienced sewers interested in soft wearables. 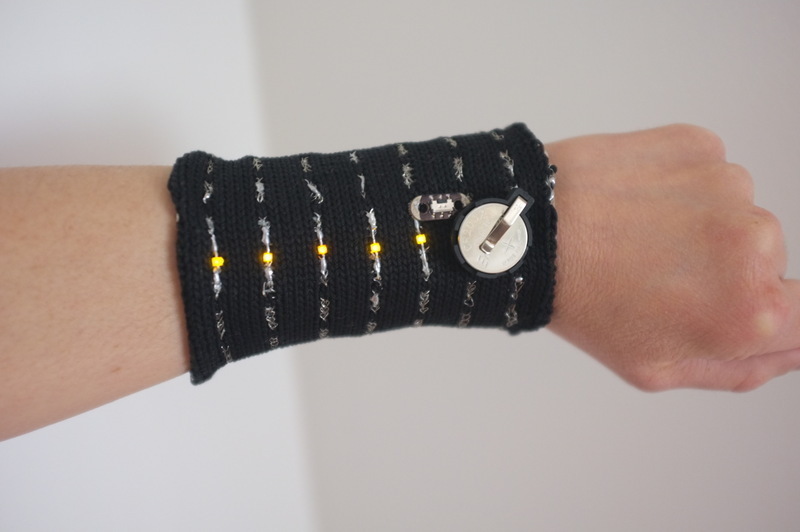 However, the conductive threads often used for e-textiles can be unstable as conductors. Silver-plated thread oxidizes over time and becomes non-conductive, something I discovered after buying a large spool and leaving it out for months. (If you have some, store it in an airtight bag.) Stainless steel thread does not have this problem, but it does have higher resistance. Creating solid connections with the thread presents another challenge. 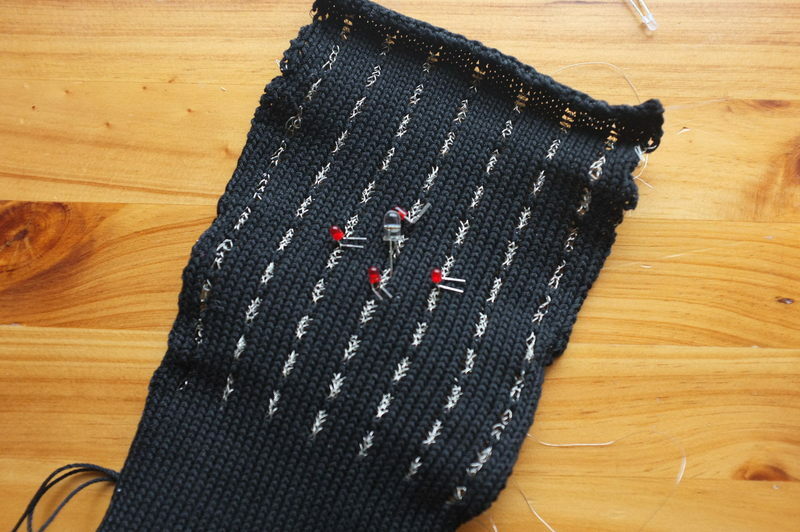 It requires hand-sewing skill, stitching the thread through the component lead multiple times, knotting tightly, and adding glue for security. The whole process makes me want to reach for my soldering iron. 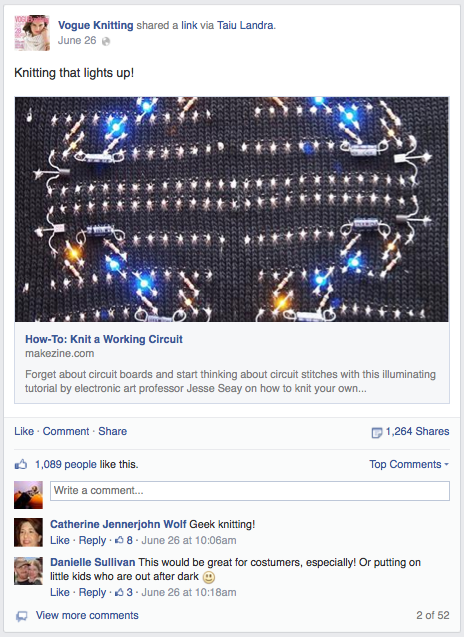 But... the conductive thread widely available in the US is not solderable. Conductive threads made with polyester or nylon wilt or melt under heat. 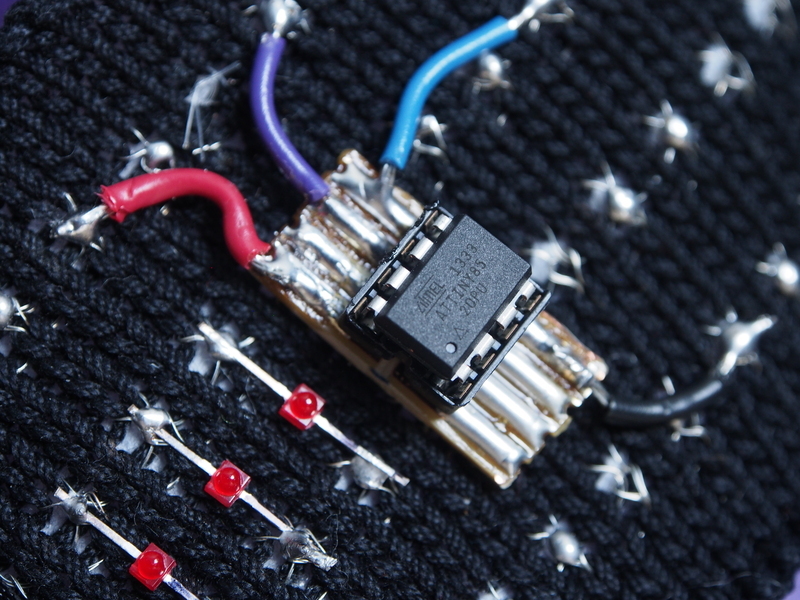 Solderable conductive thread is available in Europe, made with Kevlar. The minimum purchase, a kilogram, starts around 60 euro, from the company, Karl Grimm & Co. With shipping, you can expect to pay over $100. 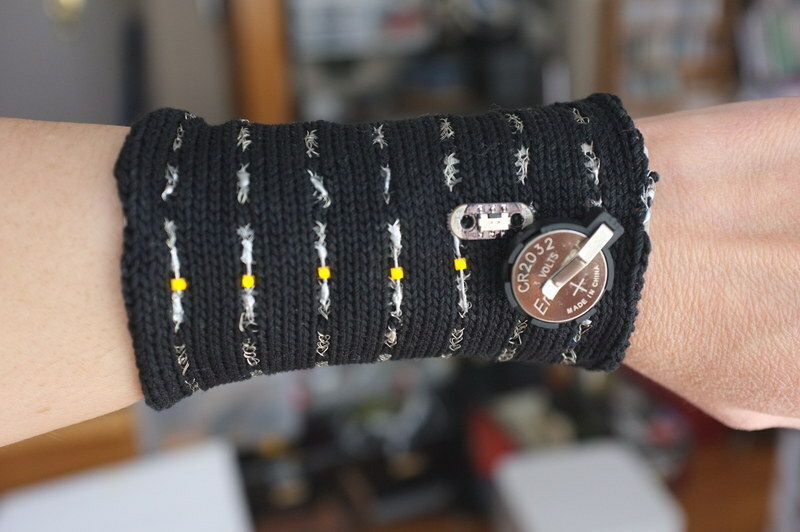 One of the creators of the phenomenal e-textiles resource, How to Get What You Want, Hannah Perner-Wilson, sells small spools of the Karl-Grimm conductive thread reasonably-priced on Etsy, but it's still not cheap enough for me to create artistic-experiments-with-abandon. 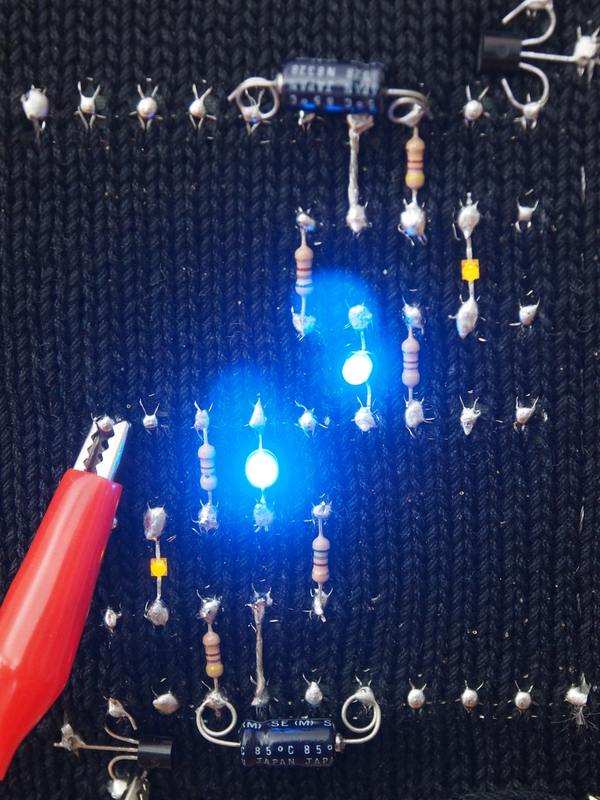 Additionally, conductive thread introduces resistance to the circuit-- it just doesn't conduct as well as the copper wire used in conventional circuits. Arduino-based circuits can compensate for this, but I'd like to build circuits using conventional components, as well. 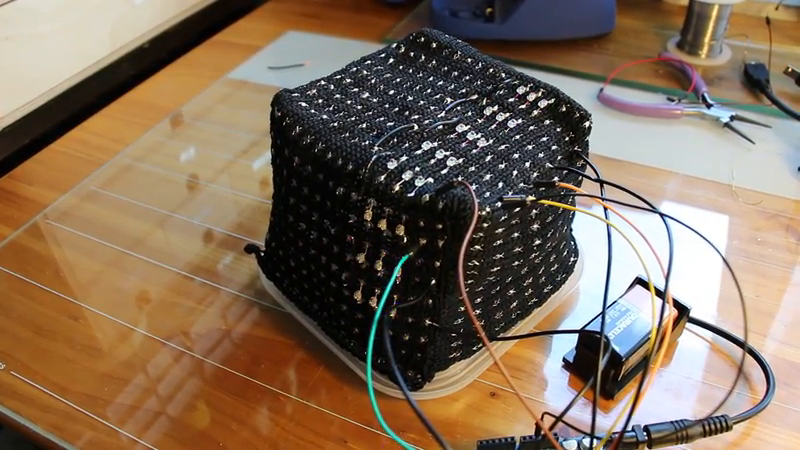 So I'm investigating how to apply textile techniques to conventional electronic materials. 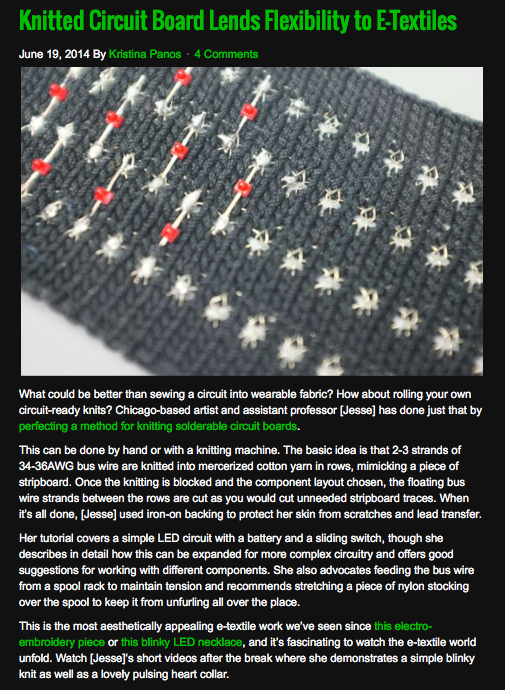 After much research, I've developed a tool-box of methods around my favorite skills of soldering and machine knitting. I'm documenting my methods here, as they evolve. 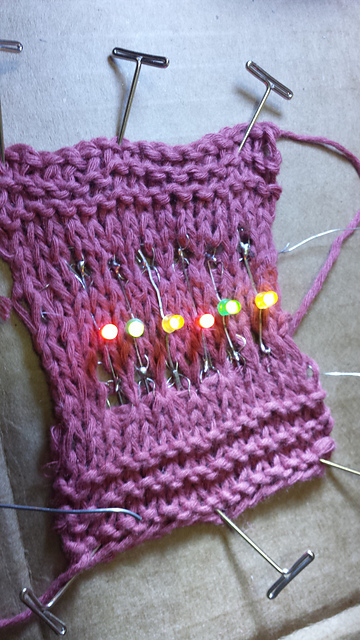 I'm experimenting with machine knitting 2-color patterns with wire and cotton to create "pads" for direct soldering of components. 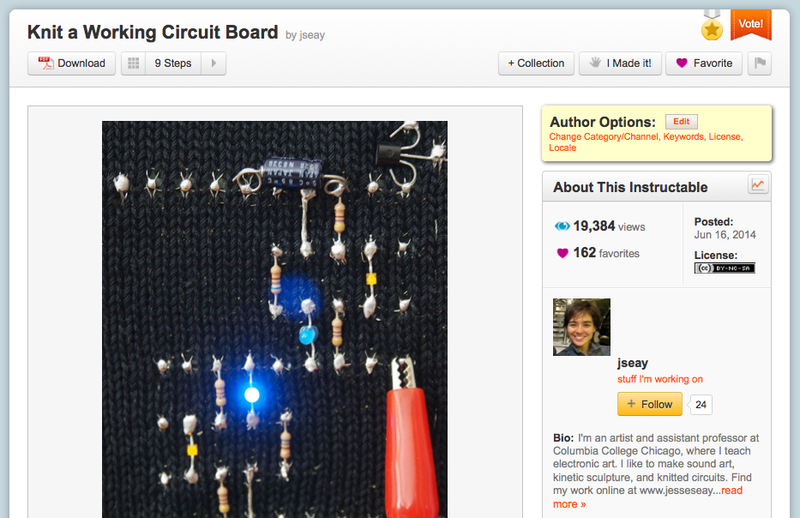 This simple circuit uses 5 leds, a switch and a battery, all soldered in place. The wire looks great, and the circuit held up fine during a day of wear.